The clock says it is 1:59 am. Our elf, Jasper has already returned from his nightly visit to Santa at the North Pole, and I just finished my last sewing project for the holiday. All the presents are bought, a few are wrapped, and tomorrow today Heidi and her family will come home. It is late, and I am tired. Nothing makes me happier than helping Santa. Hugs to you all. I'm headed to bed for a few short hours of sleep before the monkeys all wake up to see if any new presents have appeared under the tree. Jasper's a pole dancer? So excited for you to have Heidi and fam. How fun for all. I start my Christmas shopping and wrapping today. Wish me luck. I thought they weren't coming!?! HURRAY! Me too. I LOVE Christmas. And the best part of all, of course, is having the family around me. Have lots of fun with Heidi and her little fam. And enjoy the golden Christmas call, too! Christmas is beautiful and fun all at the same time. 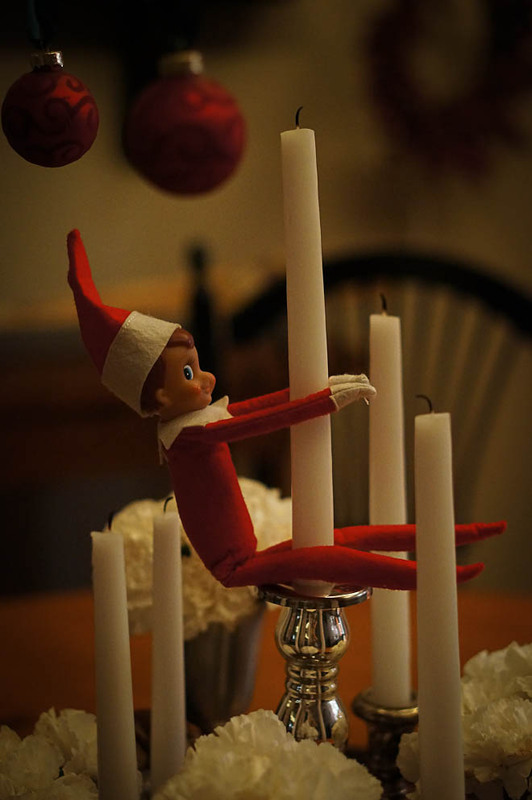 Katie has that little elf too - theirs is aptly named Buddy, and he appears all over the place keeping the girls on their toes. Hope you're having lots of fun with Heidi and everyone, and only a few more days until you can talk to your missionary! WOOT!